Every summer my skin gets really dry because of all the time I spend in the sun, I have to apply lotion everyday in order to keep it hydrated. When NIVEA asked me to review their new skin care products I was excited to try them out and see how well they worked for my skin this summer. 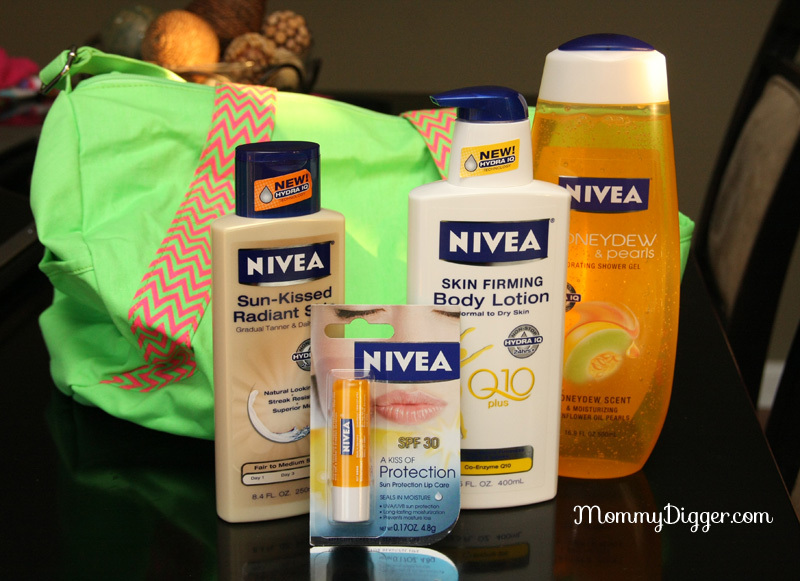 I received this fun LuLu bright green duffel bag I received four new Nivea Products to try out. First up is the NIVEA Honeydew and Pearls Hydrating Shower Gel, it leaves my skin feeling soft and refreshed. I really like the moisturizing pearls it has. It’s smells great and a perfect scent for summer! After a shower, I always need to apply moisturizer and I really love the NIVEA Skin Firming Body Lotion with Q10 and Hydra IQ. It has a nice fresh floral scent and leaves my skin feeling soft. It is formulated with co-enzyme Q10 complex and leaves skin soft and more resilient after as little as two weeks of use. I’m a naturally pale person and I’m not the type to tan. I burn very easily and have to wear a high SPF sunscreen whenever I’m out. So, I really love the NIVEA Sun Kissed Radiant Skin lotion. Not only does it keep my skin soft but it gives me a healthy summer glow without having to step foot into the sun to tan. Whenever I applied my sunscreen I never really thought about my lips. I really never protected them before but now NIVEA has the new NIVEA Kiss of Protection Lip Care. I’ve been using it daily and it has made my lips softer and provieds sun protection with SPF 30. I love the new products from NIVEA, it has helped me to keep my skin soft, tan and protected this summer and they have become a part of my daily routine. For additional information on NIVEA products and fun ways to win great prizes- Including their Million Moments of Touch date night giveaways! One lucky couple will be chosen everyday through the end of the year to win a Date Night on NIVEA worth $200! Visit www.nivea.com to find a retailer near you and buy these great summer skincare products. NIVEA is giving one lucky reader the Lulu bag packed with all the NIVEA summer skincare products! NIVEA Honeydew & Pearls Hydrating Shower Gel, NIVEA Skin Firming Body Lotion with Q10 and Hydra IQ, NIVEA Sun Kissed Radiant Skin and NIVEA Kiss of Protection Lip Care! To enter fill out the Rafflecopter form below. Ends 7/13 at 11:59PM EST. I like the SKIN FIRMING CELLULITE SERUM WITH Q10. Thank you!! I would love to try the Touch of Happiness, I just love the invigorating smell of orange blossom. A Kiss of Milk and Honey Soothing Lip Care. Most excited about trying the NIVEA Skin Firming Moisturizer Q10 Plus!